This award is circulated to those bloggers to let them know that their posts brighten your day. Carrying my massive teddy bear (named Henry) to my parent's bedroom to show them that I was as tall as Henry. I must have been about three years old. I'm pretty sure that it was very early in the morning and I'm not convinced my parents were too chuffed about being woken up! I change my mind on this all the time, but right now I wish it was late spring/early summer. I feel like I missed summer this year. Am already starting to make plans for next summer. I don't know much about flowers although it's lovely to receive a bunch every now and again. 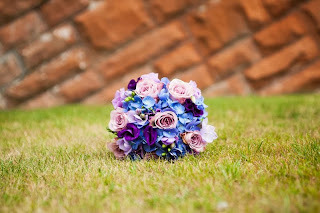 I totally loved my wedding bouquet - I spent ages gazing at it over the days following the big event. Scary food you would never ever even taste? Insects! I also tried to eat a snail once but couldn't pysch myself up enough (I am a wimp!). One day I'll try snails properly. I'm not really interested in astrology. What spice would describe you? Erm... I'm not sure how to answer that one! I guess I'd go with cinammon because it smells lovely and is fabulous in baking, which I love to do. Snooze button or jump out of bed? Snooze! I am still loving my sleep app, which aims to wake me in my lightest sleep, but that doesn't mean I bounce out of bed with enthusiasm! Slice of lemon in hot water followed by a cup of tea. Song that means something special to you? I love music that I have heard live. One example would be the classic Chesney Hawks singing the one song he's famous for. We did fireworks for a wedding that he sang at and it all went swimmingly. I don't have one! How boring is that? I quite like Brad Pitt, but that's not exactly secret. Where on the whole Earth are you happiest? Thanks so much for playing along. I love your wedding flowers, too. Fun to get to know more about you! I do love to be outside... seashore or very high hills and mountains... somewhere with big open sky. No caves or canyons for me!